The hallways seemed endless like a maze. Every turn, led to another hallway with multiple options to still more hallways and still more options. Teric was frustrated that he had not paid better attention when he was first led to Shushan’s chamber. Had it not been for a Native woman who found him, he would have continued wandering through the hallways and caverns for hours. The woman led Teric back to the communal chamber, to the feast that was still going strong, although with fewer people in attendance. The several dozen or so who had remained, were present for a particular purpose. They wanted to see Teric and Shushan enter the chamber, as a consummated couple, giving them further reason to celebrate and feast anew. However, when Teric entered the communal hall alone, there were more than a few puzzled looks on the faces of the natives who had remained in the hall, waiting for the couple to arrive. No face was more baffled, more concerned, than Hoshushanna's, who rose up from conferring with Kore and Jasen as Teric entered the hall. Teric froze under the gaze of so many concerned faces. He had not even considered what the reaction of the natives would be after his rejection of Shushan. He immediately searched for Hoshushanna and Hudus. Finding them, his eyes met theirs, and he felt ashamed, he felt guilty and looked away. “Teric!” Jasen summoned, waving for Teric to join them. Hoshushanna and Hudus had been helping Jasen and Kore to plot a route to Thaingor Peak in furtherance of their mission. Jasen was eager to clue Teric in on the plan. However, once Hoshushanna and Hudus stood up, Jasen realized that Teric was alone, and based on the reaction from the natives, it wasn’t a good thing that Teric returned alone without Hoshushana’s daughter. Teric began to walk across the breadth of the hall toward where Jasen and Kore were stationed. As he walked he felt every eye in the room on him. As he got closer to Jasen and Kore he realized that Wilhelm was not among them. He spun around searching every area of the hall, finding Wilhelm at a table with a young native boy. Relieved, he continued on toward Jasen and Kore. Just before reaching his friends he felt a hand attempt to spin him around. He turned to face Kalima, Shushan’s friend. Kalima appeared worried as she looked wide-eyed at Teric. “Where’s Shushan?” Kalima inquired. Teric was at a loss for words under the scrutiny of Shushan’s friend who seemed on the verge of tears. Kalima was not alone in her request for answers. She represented what every native in the room wanted to know including Hoshushanna her father and Hudus her brother. Shushan’s mother, who had shared her fate as a Lord maker, had retired for the evening, she loved her daughter but did not agree with her abdication, breaking the long mother daughter line of ‘lord makers. "Where’s Shushan?” Kalima asked again. “I believe She is still in her chamber room,” Teric hesitantly replied. “Why is she not with you?” Kalima asked, avoiding the question she really wanted to ask, the question everyone wanted to know. Shushan had maintained her maidenhood years longer than her mother. She had resisted a tremendous amount of pressure from everyone to surrender to Doleg. She stayed true to herself regardless of every argument put to her, whether reasonable or unreasonable, she stayed true. Kalima did not understand why Shushan chose this foreigner, but she believed her reasons for doing it. And the passion she saw in her friend, the passion and agony she witnessed in her, as she danced the Almah, had convinced Kalima that Teric was the man Shushan had seen in her dreams. Kalima was distraught at the prospect of Shushan being rejected. “Why is she not with you?” Kalima begged through her tears. As Teric began to speak, screams and gasps from the crowd cut him off. Kalima turned around to see what the commotion was behind her, and she herself, uttered a scream. At the entrance to the communal hall, stood Shushan, in the very spot where she had entered to dance the Almah. Only now, Shushan’s face was covered in smeared blood, as she stood motionless, and seemed to be in tears. Teric was in shock, he wondered what she had done to herself. He felt nervous as those concerned eyes that concentrated on him when he entered the hall, were now becoming hostile in the light of Shushan’s appearance. “What did you do to her?” Kalima shouted as she ran towards Shushan. The native warriors in the room drew their weapons and took aim towards Teric. Hoshushanna and Hudus strode towards Teric as more natives followed them. Teric was concerned more for Shushan than for himself, he watched as Kalima embraced Shushan. He wanted to go to her, instead he remained still, unsure what any sudden moves from him might cause in the approaching warriors. As the Native warriors reached Teric and began to detain him, Shushan screamed from across the room. “No, let him go, he has done nothing to me.” She ran over to Teric inserting herself between Teric and the warriors. “Let him be,” Hoshushanna ordered. The natives stepped away at Hoshushana’s command. Teric took Shushan by her shoulders, which knee jerked Hoshushanna’s guards into an attack stance. Hoshushanna with a wave of his hand beckoned them to stand down. “What happened?” Teric asked her. Shushan saw the true concern in Teric’s face, and it reassured her that she had made the correct decision. Despite how things turned out for the moment, she knew somehow that Teric would be hers. She felt so much love for him and tears welled up in her eyes. She lifted Teric’s blood stained cloth for him to see. “In the dim light I couldn’t see, I used it to dry my eyes and…” Shushan smiled at Teric, and he melted in her presence. That smile was joy and pain to him. She began to laugh and he followed as they embraced one another. In the midst of dozens of Albians, it was as if Teric and Shushan were alone, back in her chamber room. They embraced a second time as all eyes were riveted on them, and then they separated. Teric made his way through the crowd toward his friends and Shushan found Kalima again and they embraced. Hoshushanna was at a loss at what he was witnessing. He had no idea what had happened or what was happening between his daughter and Teric. He didn’t know. But he was going to find out. Shushan obeyed her father’s request and made her way through the crowd to face her father. Teric’s notice had been arrested by Hoshushanna’s call. “Yes, father?” Shushan asked, knowing what her father and every person in the room wanted to know. But she did not want to say, not because she was embarrassed, she was not. It should certainly be clear to everyone by now that She was unconcerned how others viewed her. She wanted to keep what was between her and Teric, between her and Teric. Shushan smiled to mask the pain she felt. She found Teric’s eyes across the room and saw in them, pain, equal to her own and she was comforted. He was suffering just as much as she was, and maybe even more. He wanted her, she was certain of that, but there was something, known only to Teric that compelled him to walk away from happiness. And it must be eating him up inside, she thought. “Shushan!” Hoshushanna’s insistence pulled Shushan out of her trance. Startled Shushan turned toward her father, remembering what he had asked her. “Then he has rejected you?” Hoshushanna asked, not wanting to accept what Shushan’s answer would mean. That word was like a dagger to her heart, she felt rejected, but Teric had told her that he was not rejecting her. “I can’t answer that, you will have to ask him.” Unable to maintain her brave front She began to weep, covering her face. Kalima rushed in and interrupted Hoshushanna’s interrogation to rescue her friend. “That’s enough,” Kalima demanded as she took Shushan’s hand and began to led her out of the hall. Everyone in the hall was stunned, and still, many did not know what was going on. Was Shushan joined or not? Some began to leave the hall as no one felt in the mood for merriment any longer. Hudus however, was upset and he felt protective for his sister. He wanted to get it settled for her. Hudus confronted Teric, invading his personal space. “Did you reject my sister?” Hudus demanded, aware of how harsh his words sounded, but he didn’t care. On impulse, Jasen stood in front of his friend, facing down Hudus. Teric put a hand on Jasen’s shoulder, pulling him back. “It’s OK,” he reassured Jasen. Teric stepped in front of his friend to face Hudus and a gathering of warriors that stood behind him. “Did you reject my sister?” Hudus repeated. Rejection, was not the right word. He had not rejected Shushan. He wanted her and would have had her if he was free to choose, but he wasn’t free to choose. His course was decided for him a long time ago. The look on Hudus’ face revealed his bewilderment. But Teric was right, he was free to decide. Hudus never even gave it a thought that his sister would be rejected. “I am sorry, Hudus, and to you Hoshushanna. I am grateful for your assistance on our behalf in the forest, I am. I am in deep and painful conflict regarding Shushan. I wish that I could surrender to her, if I could, my life would be complete. But, I cannot. I am not free, to do as I wish.” Teric paused as he looked around the room, as if, he was speaking to everyone present. Hoshushanna rose his hand high as a signal to those who were able to interpret it. The warriors standing behind him and Hudus, began to disperse and to depart the hall as did many of those present. The spectacle was over. “They already have,” Jasen spoke up carrying a large sheet of paper. “They helped us to map out a route to the mountain peak.” Jasen pointed out the path to Teric. As Teric, Jasen, Kore, Hoshushanna and Hudus, looked over the map, Wilhelm was being befriended by a young adolescent looking boy. Tukka was tossing a small ball back and forth to Wilhelm unconcerned regarding the drama that had been unfolding before him. Although Wilhelm was interested in the drama enveloping Teric and had paused the game at various tense moments. However, Tukka, just wanted to play and he would remind Wilhelm in various ways to continue the playing. Wilhelm heard his name among the huddled group and while tossing the ball to Tukka, he maneuvered closer to them so that he could get a better idea of why he was the subject of their conversation. Wilhelm dropped his arms in disappointment after ascertaining why his name was being used in conversation. Jasen had asked Hoshushanna to let Wilhelm stay in Udin, to stay under their protection. Wilhelm did not want to stay in Udin, he wanted to go to Maessa, he wanted to see Anya. With his hands lowered the ball Tukka had thrown his way, hit him square in the chest, knock the wind out of him. Wilhelm picked up the ball and waved to Tukka, trying to signal to him that he was done playing. As he handed the ball to Tukka, he thought of an idea, a brilliant idea. Kenton entered the RSC entrance just as Jak had exited through another doorway. Kenton immediately turned around and quickly exited out of the same doorway as Jak. Jak spun around and walked up to meet Kenton. Kenton was surprised to see Jak alone, he was sure that the next time he saw his Director he would be sharing a prison cell with him. But Jak had walked out of the RSC building alone with no security guards trailing him. “Sir, is the session over?” Kenton asked. Kenton felt a measure of relief at Jak’s news. But he had some news of his own. Even though Jak expected that the preliminary report of the attack on the Enola would be confirmed. Knowing the details, that a coordinated and massive missile attack brought down an Akadian Government vessel, was horrifying to him. What was more worrying to him was who would brazenly attack an Akadian ship. “Yes,” Jak answered. “And we will, right now. When I returned to find that the session was over, I worked on securing an audience with the crown. And I was successful, so you and I have an appointment. Kenton felt momentarily weak at the news. He had never set foot in the Royal Offices at Woodsen Hall, let alone briefed the King. He never heard another word Jak uttered as he contemplated any number of possible disasters he could commit before the king. “Kenton,” Jak called from some distance away. Still paralyzed by his own thoughts he had failed to follow after Jak. “Of course, you know more about this thing than I do,” Jak replied as he started to walk again. Kenton paused momentarily after catching up to Jak. It was Jak’s words that got to him, ‘You know more about this thing than I do,’ he thought, and wondered if he was being set up to take the fall for this disaster. Knowing Jak however, Kenton knew that Jak wouldn’t do that to him, in fact he knew that Jak would try to shield him from any fallout. He was comforted by that thought. He continued to walk, keeping pace with his boss and mentor. Hidden to the eyes of the Albian warriors patrolling and searching Thaingor forest, locked in high orbit above Knome, a massive heavily armored unmanned spacecraft equal to the mass of a Class C battle cruiser was in the process of targeting an area on the planet’s surface. The ship was one large weapon, with a number of successive cylinders protecting its long recoil mechanism, out of which protruded a massive double barrel emissions canon. Dozens of engines around the craft maneuvered and guided it in position. The Catapult siege vessel with its de-atomizer weapons system was being controlled from a nearby command ship. Stabilizer fins were being extended as the weapon was being charged. Commander Hyven Rof stood on the bridge of the Intruder’s Command and Control Ship observing the massive weapon with pride and wonderment through the ship’s viewport. He was filled with excitement to witness the Intruder’s capabilities in live action. A new powerful tool in the Ground Assault Unit’s arsenal. “How long before the weapon is charged?” Hyven asked impatient. “We’ve entered the last quarter, Sir.” came a reply from someone on the bridge. “Good, very good!” Hyven tapped a button on his wrist band. 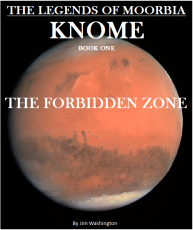 “Commander Rof,” came a voice in response to his call from Knome’s surface. A brigade of troops was amassed several klicks outside of Thaingor forest. "Very Good," Commander Izkan Doomaz replied into his communicator as he looked upon the mass of troops in front of him. From his vantage point on the mobile command structure, he felt excited and a little disappointed. He had requested four times the number of troops he was given. Izkan shared the Emperor's military philosophy of overwhelming and relentless force. Regarding the Brigade he looked upon, he had no doubts that it would accomplish the mission. 'Overkill,' was the relentless drumbeat that sounded in his mind. Still it was beautiful to look upon, rows and rows of heavily armed and armored troops, rows of assault vehicles and dozens of heavily armed air support crafts. No more drills, no more war games, no more waiting. The Emperor had cast the die, and there was no, turning back! After Teric, Jasen, and Kore had left with Hoshushanna, Hudus and a band of warriors, Wilhelm employed Tukka to lead him to Maessa, Knome’s principal city, and to Krestlin Palace, to Anya. Wilhelm was filled with anticipation at the thought of finally seeing and holding Anya. He could barely contain his excitement. Tukka had acquired a Lumaiza robe for Wilhelm to wear once he reached the city. “What is this?” Wilhelm asked, taking the robe from Tukka. “Do you want me to wear this?” Wilhelm asked as he looked it over. “I don’t know if I want to impersonate a priest,” Wilhelm replied unsure of the tactic Tukka wanted him to use. “A blessing?” Wilhelm asked still unsure. “What would happen if I spoke?” Wilhelm asked. It didn’t take long for Wilhelm to decide, he was desperate to see Anya and he was so close. He looked over the robe and started to put it on. Teric, Jasen, and Kore had followed Hoshushanna, Hudus and company for hours through the underground caverns. “How much longer?” Kore bemoaned. “Just asking,” Kore replied trying to recover from his embarrassing complaint. Teric was starting to feel like himself again. After considering their route and contemplating various scenarios that they may encounter, the effort was putting distance between him and the tragic events and emotions involving Shushan. It was clearly evident that the Myans had somehow infiltrated the planet. What was unsure was whether or not the Knomens were victims or conspirators. “Are you alright?” Jasen asked. “Yeah, sure,” Teric replied still engrossed in his thoughts. “What…” Teric asked unsure what Jasen had just said. Having just put distance between those events in his mind, he didn’t have any desire to revisit them. “Don’t worry about it.” Teric replied hoping to cut off the conversation. Jasen wasn’t upset at Teric’s testy reply. He saw the pain in his face and he regretted bringing up the subject. He wanted to comfort his friend but didn’t know how. “Wait!” Hoshushanna held up a hand as everyone stopped in response to his gesture. He signaled to his warriors and two of them headed down the cavern to see who was following them. In the distance there was the sound of a struggle and the cry of a woman’s voice. The two warriors led Shushan forward to meet the group. “Shushan, I told you, you could not come!” Hoshushanna screamed, quite upset with his daughter. “Papa, I’m sorry, I know you did. I was compelled, please don’t turn me away." The last few words she said while looking at Teric. Hoshushanna, glanced at Teric who nodded his head slightly. “Very well, no hysterics.” Hoshushanna smiled at her. “I promise father,” she replied not taking her eyes off of Teric. As the group began to walk again, Shushan maneuvered so that she walked along side Teric. “Are you upset that I came,” Shushan asked, fearful of Teric’s reply. And she had resolved that if he didn’t want her there, she would turn around and depart. But she felt compelled, that he wanted her. “I can never be upset with you Shushan,” Teric replied not looking at her. The group continued on. Shushan again took Teric’s hand and then arm as they walked together. Teric truly was happy with Shushan by his side. It felt right. When she wasn’t there, it was painful to think of her. But now all was right, all was well.